This sport. This sport of MMA sometimes. There’s no such thing as a bad question, but there are plenty of bad referees roaming the cages of our great sport every single weekend. In a sport where you get locked in a steel cage with another human being, at a baseline level MMA is by far the most dangerous sport in the world. Arguments could be made for Indy car/ open wheel racing or some fringe extreme sport only seven of you have heard of is more dangerous than MMA, but it’s still a debate. The problem is that good quality MMA officials can not keep up with the rate MMA is growing. On a Monday head over to Sherdog or Tapology to check out the results on anyone of the 52 weekends of the year and you’ll find a mind numbing number of MMA fights that took place. As we type this post, there may be an obscure MMA show happening right now. Grabaka Hitman or Jolassanda are somewhere watching that Monday afternoon MMA show for the sake of MMA history. 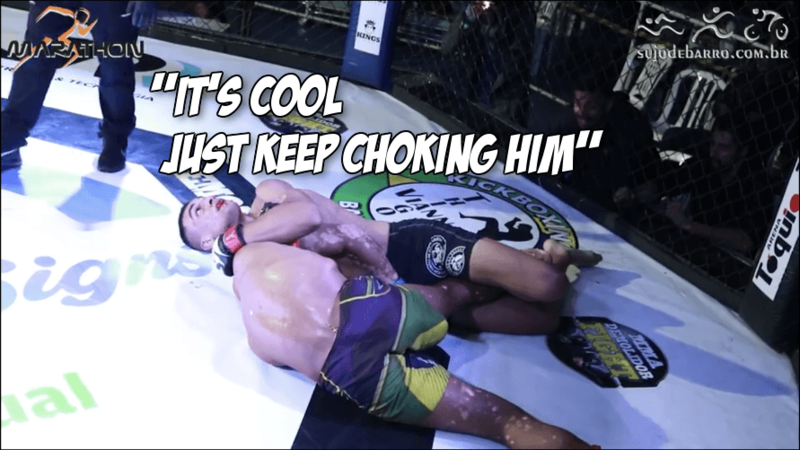 From an event over the weekend in Brazil, here is a bad referee doing bad referee things. Just unconscionable things to another human being he is assigned to protect. So many bad MMA refs, so little time. Rafael Coxinha Barbosa locks in a pretty choke and Melk Kaut struggles but clearly stops fighting off it. We see it. Barbosa sees it and asks to stop. Yet, the ref in the cage and Kaut are asleep at the wheel. So much extra choking here. Sweet Brazilian Jesus. Reports are Kaut experienced seizures post-fight.